This whole golden opportunity to fly to Tokyo, Japan and stay there for 5 nights was my boss's idea. The director of the government body that I work with has kindly recommended me along with two other co-workers to attend an international conference held at Makuhari Messe, Japan. And boy was I excited! Being the youngest among the three, I was assigned to do all the paperwork, hotel reservations and route planning in order for our journey to Japan to go smoothly. I had some setbacks especially when it comes to applying the budget and visa applications, but God was kind to me and everything become alright. 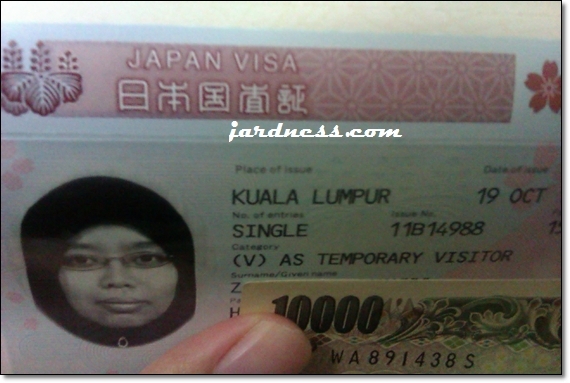 I got scared when precondition for Japan visa was to have RM10,000 in your savings account. By golly! Applying the budget was another thing. Thankfully it was fully sponsored by my workplace but I had to plan within the approved budget. How much? That's a secret! *wink2x! 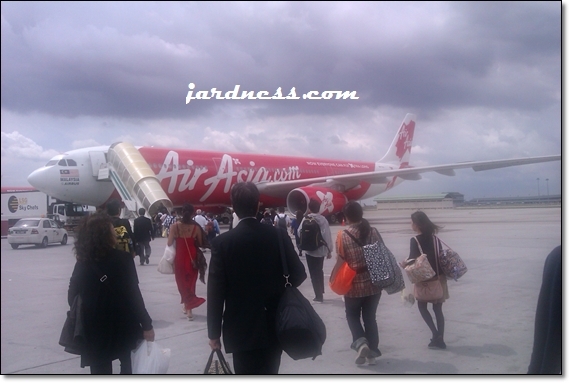 In order to cut costs, we had to fly via AirAsia instead of our official carrier which is MAS. Sorry MAS... AirAsia was just so cheap compared to your fares for the same destination. So Haneda Airport here we come!!! Walking to the airplane has never felt so good! Kah kah kah! I don't know any word of Japanese and had to download some Japanese Language for beginners onto my iPad just to pass my time on the 7 hours flight from Kuala Lumpur to Tokyo, Japan. 7 hours!!!! Mygosh!!! But alas... I slept mostly on the way. LoL!!! TOUCHDOWN at Haneda Airport, Japan! See my flight number from Kuala Lumpur? We met some friendly Malaysians who were on the same flight as we were waiting for our luggage. For them it was like the 10th time they've been here, as for me.. it was my first. Haha. Jakun aku wei! And while we figured out on how to get to our hotel, we took pictures with the nice Japanese lady who assisted us. 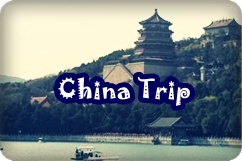 We learnt how and where to buy the airport limousine tickets and which port to go to. The Japanese people working at the information counter were very helpful and cheerful even though the time was about 11 pm. I wouldn't say that the ticket price was cheap, considering it only took about 40 minutes to the hotel via bus. 1200 yen y'all!! That's equivalent to RM55.00! They have the same ticketing procedure with Seoul, Korea. Maybe because we wore hijabs? It was a relieve when we finally were let go to resume our trip to our hotel. A TV screen to show the routes the bus would go through. Fair enough, the signages around Haneda Airport was helpful. And we didn't get lost in finding our way to the bus stop. When we finally reached the Shinjuku Washington Hotel, we got confused because when we stepped into the building, there was no lobby on the first floor. A guy passed by and suggested we went upstairs. We had to bring our heavy luggage up the escalator to search for the lobby. We couldn't find any lift. It was only on the 3rd floor that we finally found the lobby's signboard. Ishhh... menyusahkan. Would've been nice if there was a signboard downstairs to ease foreigners. Our room was on the 19th floor with its window facing the streets of Shinjuku. Everything was in a minuscule scale. The room, the bed... even the bathroom was mini despite having a bath tub which was also tiny. Can't lay down fully in that one! Bathrobes were placed on the foot of each bed. We went organizing our stuff. Just below hooks meant for the hangers of our clothes, we piled up our food stocks for the week. LoL! There wasn't enough leg room for praying and we had to move a sitting chair away, just to make room! It was funny to remember that my roommate has changed her kiblat three times before settling for one. I advised her to throw her useless compass away since it kept showing different directions! LoL! Minuscule bathroom with an electronic toilet seat! And behold!! Our OPEN closet! All in all, paying a hefty RM500++ per night in a small hotel room like this in Japan makes us feel thankful for the equally priced but overly spacious hotel rooms back in Kuala Lumpur. On a positive note, we received FREE internet LAN access. Just have to bring a laptop that can access to LAN as there's no Wi-Fi. Plus there's a hairdryer and electric kettle. And with all that I've written, I'll call it quits for the day.